Candy, Candy, Candy I Can’t Let You Go! 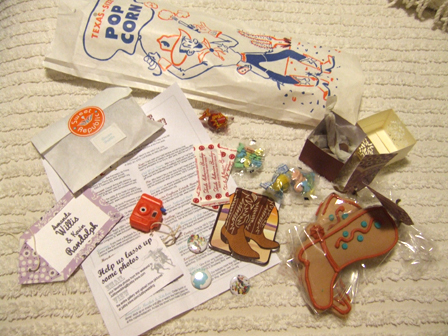 1st disclosure: I love candy. The colors, the smell, the way it takes you back to a time before bills and paychecks and house payments. 2nd disclosure: I have no emotional attachment to flowers. I can see that they’re pretty, and I can appreciate a beautiful bouquet or arrangement. And I REALIZE that I want to be an event designer and will have to work with flowers as part of the deal. But I was never one of those people who are like “OMG I HAVE TO TOTALLY HAVE ORCHIDS AT MY WEDDING OR ELSE.” There’s nothing wrong with it, it was just never my style! Candy though? well… sign me UP. Oh what’s that? you’re still seated? That’s several pounds of hand-spun, Hammond’s lollipops goodness. Emphasis on the several pounds (it was heaaaavvvyyy!) That pink one is 1lb on its own! With the help of my wonderful and patient groom Bobby, we rubber banded, electrical taped and ribboned the tar outta those lollis so they’d stay perfect all day. 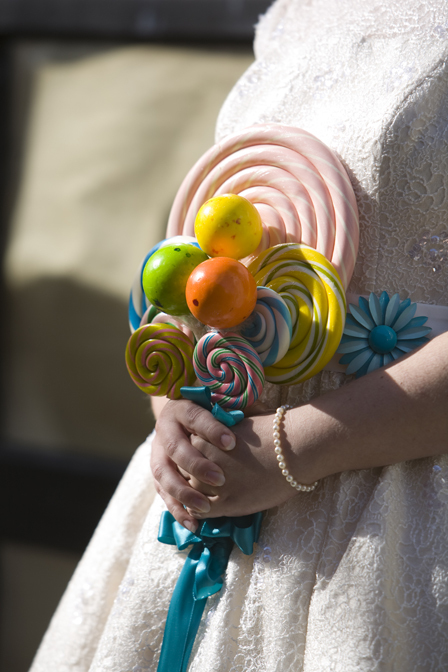 Lollipops were one of the major recurrent images of our wedding. The 1 oz. 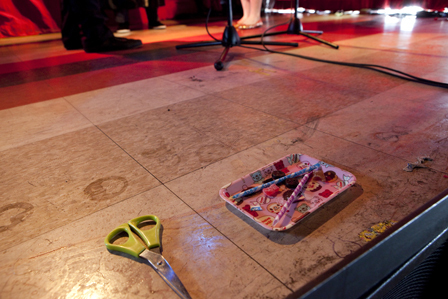 Hammond’s lollipop sat at everyone’s seat in the reception. 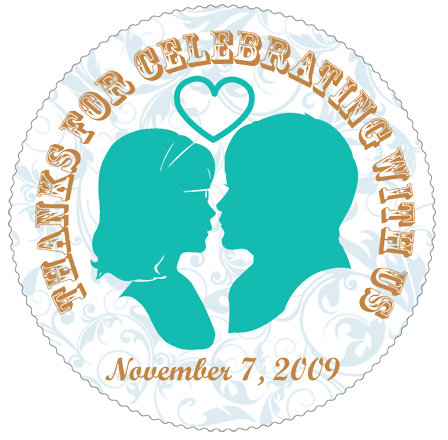 The colorful delicious discs served as our favors, with this label (printed from our inkjet onto label paper) on the back. 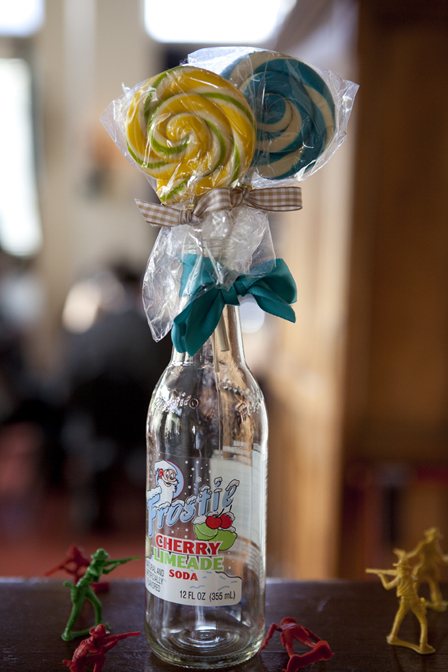 With the extras from the favors (the lollipops were purchased, stickered and packed away before the final guest count) and the bouquet, we created lollipop arrangements in soda bottles recycled from the Ice Cream shower. 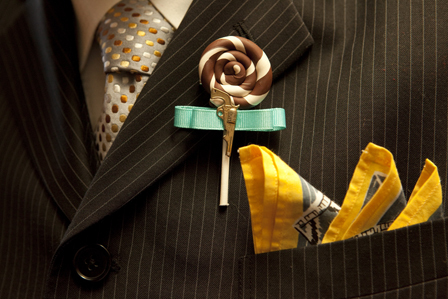 Our lollipop links didn’t stop there, I made the boutonnieres out of polymer clay for the special dudes in our wedding. 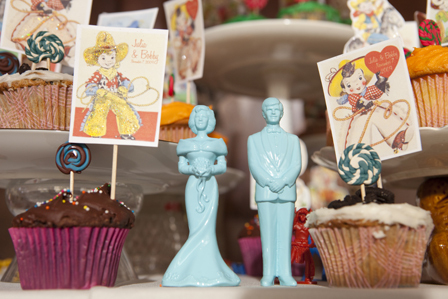 And Bobby and I made 150+ mini lollipops to put on the cupcakes. 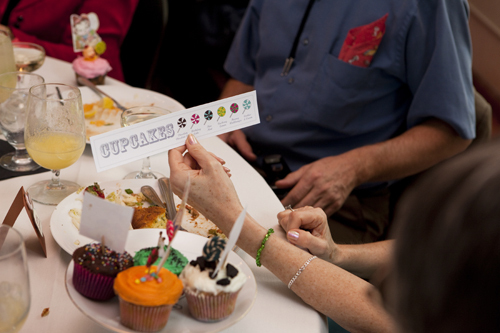 A sign designated which cupcakes corresponded to which flavors. 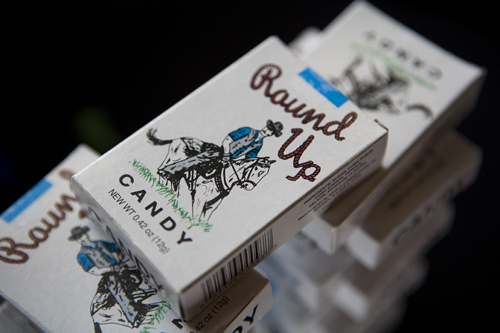 In other candy cameos, we had a table set up with candy cigarettes that matched the OTHER major theme, 50s kiddie cowboy. I didn’t buy enough for the entire guest list, just a suitable amount to display so if guests wanted some, they could take them, but at the same time, it wouldn’t break our budget. They were snatched up FAST. 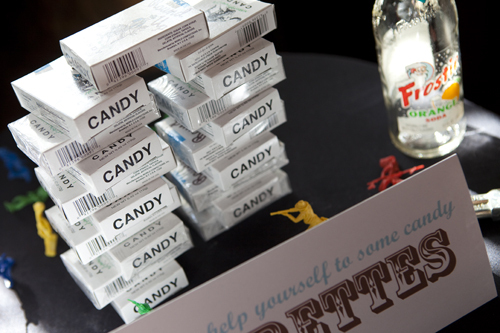 But candy wasn’t just a cosmetic addition to our wedding. 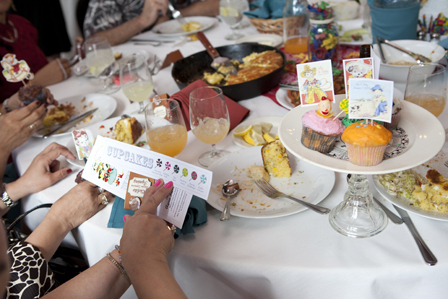 Instead of a unity candle lighting or sand ceremony, we adapted a ritual that uses food to symbolize the different aspects of the couple’s future. 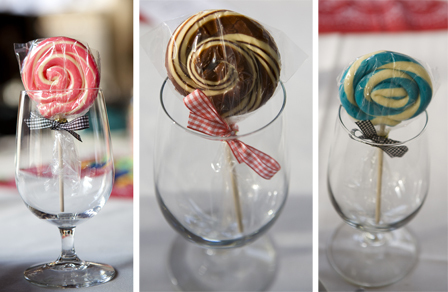 The different flavors are usually expressed with vinegar, lemon, etc., but well…. it was actually just another excuse to eat some candy! 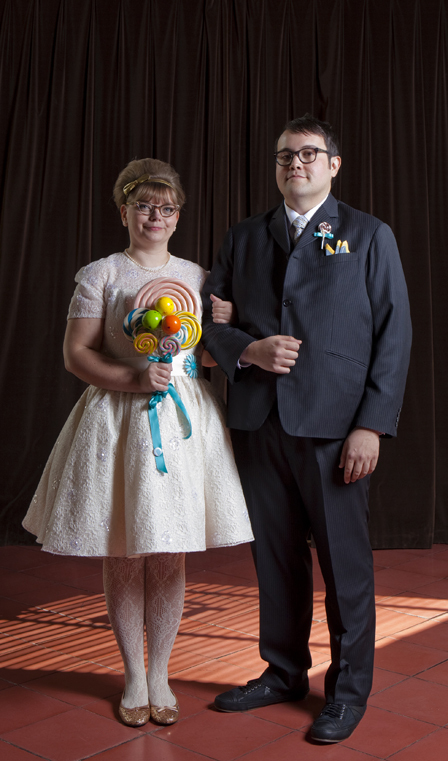 Our officiant helped us create a unique ritual with candy and explained the meaning behind each flavor. used are pungent, salty, sour, bitter, and sweet. Sweet, symbolized by pixie sticks, represents meditative thinking, earth, keeping them grounded. 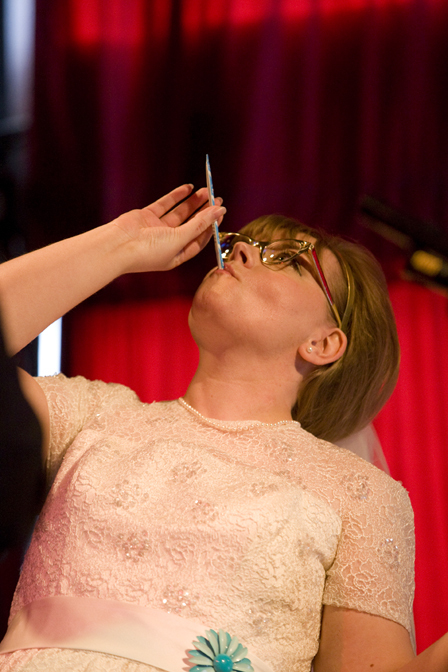 How cool is it that our wedding photos include me downing a pixie stick? © 2010 Fun With Jubby. Powered by Wordpress.